Sticky Password is one of the best password manager available in the market as of now. We are conducting a giveaway of Sticky Password Premium licenses and also you may buy a life time license of the product with 50% off too using the link provided at the bottom of the post. This application is available for Windows, Mac, Android, Windows Phone, iOS. It is advised that you need to set different passwords for different accounts, but it is not that easy to remember all the strong passwords for each account. Password managers are applications which can help you to do this by remembering just one master password. Password Manager - It can save your passwords and also can generate strong passwords for you. Auto fill – Fill the fields with just one click which can save a lot of time. Form Filling – The application can automatically fill online forms with the data stored in it such as , name, email, address, pin, phone number etc. The application supports finger print scanning authentication and AES-256 encryption of data. Cloud Sync – Your passwords will be synched with all your devices such as PC, Phone, tablet etc. Cloud backup – Which will protect your passwords even if you lost your device. Also you can sync your data using your local Wi-Fi. The premium version will cost you $19.99/year or $99.99 for Lifetime. Sticky Password is giving a chance for Geekiest.Net readers to buy the Lifetime license of Sticky Password Premium for just $49.99 (50% OFF). We have 10 full version licenses of Premium version (One year license) to giveaway. Time limited giveaway - Here is an Unlimited Giveaway of Sticky Password Premium license giveaway, you can get a FREE full version license from this link also Life time License will be just $30. We prefer you to get it from there as it is an unlimited giveaway and everyone will get a license for sure. 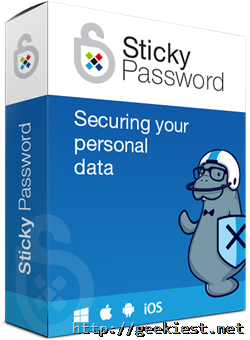 Free Sticky Password Premium license giveaway. Password Boss Password manager Premium License giveaway.